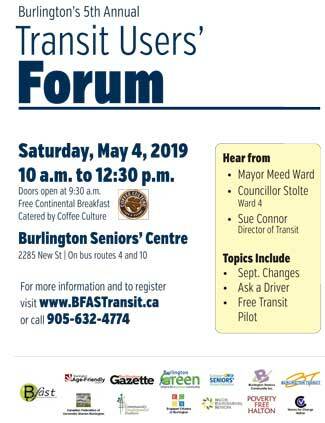 Burlington Transit passengers will have a chance to discuss proposed service improvements scheduled for September at this year’s Transit Users’ Forum on Saturday, May 4 at the Burlington Seniors’ Centre. It will be the fifth annual such gathering sponsored by more than a dozen community organizations in Burlington. The forum starts at 10:00 a.m.. Doors open at 9:30, and a continental breakfast will be served. Click on the graphic to download a poster for the event. Transit riders will also have a chance to discuss service issues with drivers, who will participate in a panel discussion, and to vote on an annual transit report card. “Where past forums were dominated by pleas for greater funding, this year’s meeting will focus on sustaining and improving the service. 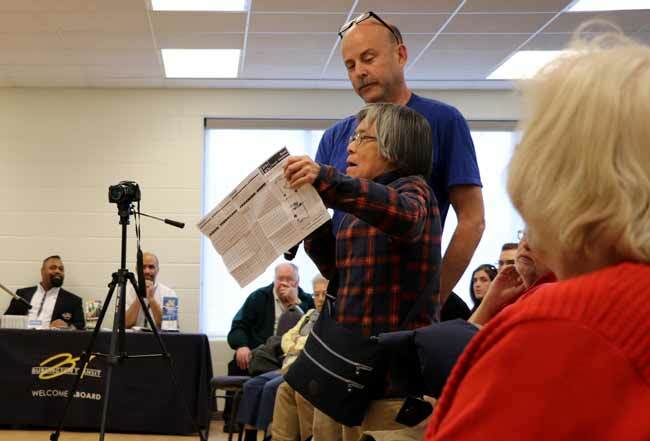 A significant increase in the transit budget, approved by the new City Council, has opened the door to a better transit service in Burlington,” said Doug Brown, chair of Burlington for Accessible, Sustainable Transit (BFAST), the lead organizer of the event. This year’s meeting will be co-sponsored by Burlington Transit, which will also provide logistical support for the event. Connor and Mayor Marianne Meed Ward will also speak to the gathering, which averages attendance of more than 100 people each year. This entry was posted in BFAST News, Uncategorized on April 15, 2019 by Collin Gribbons. Marianne Meed Ward, Burlington’s new mayor, celebrates her election victory with BFAST’s Doug Brown on election night. 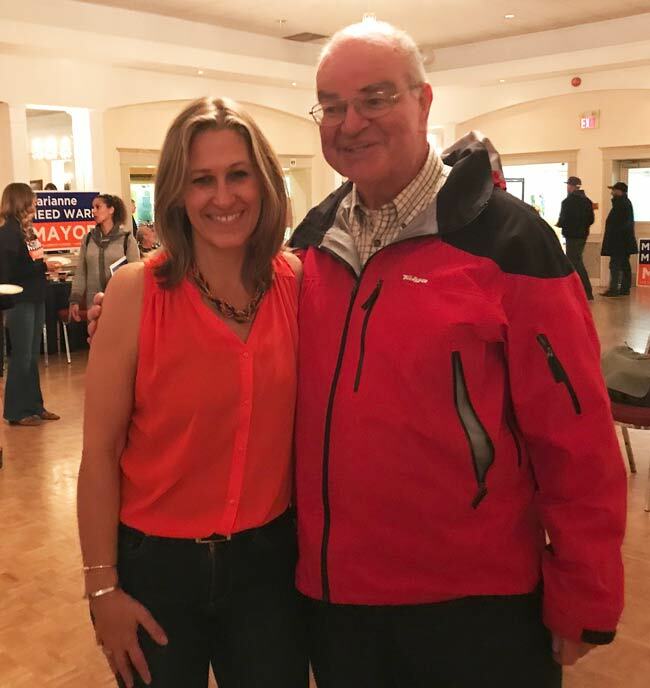 “We’re going to fix transit.” With those words, newly-elected Burlington Mayor Marianne Meed Ward accepted the congratulations of BFAST Chair Doug Brown following her convincing electoral win in municipal elections Oct. 22. “It’s the start of a new era in transit for our city,” commented Brown after results showed that five pro-transit councillors were elected along with the mayor. Only Ward 5 Councillor Paul Sharman was re-elected from the council in which Meed Ward was on the short end of too many 6-1 votes. The new councillors include Kevin Galbraith in Ward 1, Lisa Kearns in Ward 2, Rory Nisan in Ward 3, Shawna Stolte in Ward 4 and Angelo Bentivegna in Ward 6. Incumbent Paul Sharman was re-elected in Ward 5. Every one of the councillors except Sharman answered BFAST’s candidate survey very positively. Now the serious work begins on fixing transit in Burlington. BFAST will be seeking to arrange meetings with the new councillors before they’re sworn in in December to answer any questions they might have on the transit file and to promote the pro-transit agenda. BFAST’s first priority is to update the transit service standards last updated by city council — and then ignored — in 2013. One of the challenges ahead will be working with the new provincial government to ensure it continues to help fund municipal transit, as well as the GO system. A BFAST delegation held a meeting with MPP Jane McKenna prior to the election to discuss the issues. “We’re happy to have established a cordial relationship with our new MPP and look forward to working with her in the years ahead,” said Brown. This entry was posted in BFAST News, Uncategorized on October 30, 2018 by Collin Gribbons. Mike McDonald, a member of the BFAST Steering Committee and a key figure in organizing this year’s Transit Users’ Forum, died July 20 following an illness. Mike was always willing to pitch in to help with whatever work was required. He organized facility arrangements for this year’s Forum and managed the audio that allowed the question-and-answer session to be such a success. A former driver, Mike helped to bring an operator’s perspective to discussions on transit with city officials in his role as a member of BFAST’s steering committee. A visitation will be held at Smith’s Funeral Home , 1167 Guelph Line, on Saturday, July 28, followed by a memorial service and reception. This entry was posted in BFAST News, Uncategorized on July 22, 2018 by Collin Gribbons. Burlington’s new transit director will outline her plan of action for repairing and improving the system when she speaks at the Fourth Annual Transit Users’ Forum Apr. 21. Following her report, she’ll be part of a panel that will answer questions from the audience and discuss the issues that transit users raise. The Forum will be held at the Burlington Seniors’ Centre, 2285 New St., Saturday Apr. 21, from 10:00am to 12:30pm. Registration starts at 9:30am and a continental breakfast will be provided. Sue Connor was appointed to the job less than a year ago, but has already taken decisive action to make the system safer and more reliable. She helped to secure more than $1 million in new funding from City Council to hire more drivers, supervisors and mechanics to make Burlington Transit legally compliant and more reliable. While the extra stopgap funding is welcome, Burlington Transit needs a greater commitment from City Council and a strong, sustained funding base, said Doug Brown, chair of Burlington for Accessible, Sustainable Transit (BFAST), one of more than a dozen community organizations that support and sponsor the annual transit forum. Connor, Chair of the Canadian Urban Transit Association, is well known for her success in transforming Brampton’s transit system, which has posted ridership gains in the double digits over the past few years. Burlington’s ridership showed double-digit declines over the same period due to the underfunding of transit services by Council. This year’s Transit Users’ Forum will also feature the third transit users’ report card. Last year, more than 100 users rated the system and this year’s Forum participants will also determine Burlington Transit’s marks. • Burlington Seniors Community Inc.
For the first time, Burlington Transit has also signed on as a sponsor of the Forum. This entry was posted in BFAST News, Uncategorized on April 12, 2018 by Collin Gribbons. The City of Burlington has launched a new survey on transit which they say is aimed at transit riders and people who currently do not take the bus. The survey is available until March 26th 2018. The survey is a nice idea – but is a very minor item and so much more is needed. We believe that the City Manager and new Transit Director are committed to improving transit. However, this will require a political commitment for increased long-term transit funding. Will this be possible given that our council that has consistently cut transit and and the City now spends less than one half of the GTA per capita average on transit? The analysis that James Ridge, Sue Connor and Colm Lynn presented to Council on September 7, 2017 made a very compelling case for immediate money to bring the transit system up to labour standards and provide better safety and reliability. For the first time in recent years, this council listened and approved the emergency funding. During his September 7 presentation to council, the City Manager made clear that the emergency funding would still leave Burlington with “a crappy system” i.e. with low service levels and long wait times – but at least it would run on time and within provincial labour standards. So what is really needed now is a comprehensive transportation study that will look at all aspects of transportation, roads, cars, transit, walking, cycling, parking, and development. This study should develop alternative options and evaluate the alternatives against economic, social and environmental criteria. Unfortunately, this is not happening as plans for transit, roads, parking, and cycling continue to be developed separately. The City must begin to look at the cost of transit with regard to all the benefits that a robust transit system would provide – i.e. large savings in road and parking expenditures; improved air quality; improved road safety; improved social accessibility and equity; and savings in private automobile costs. 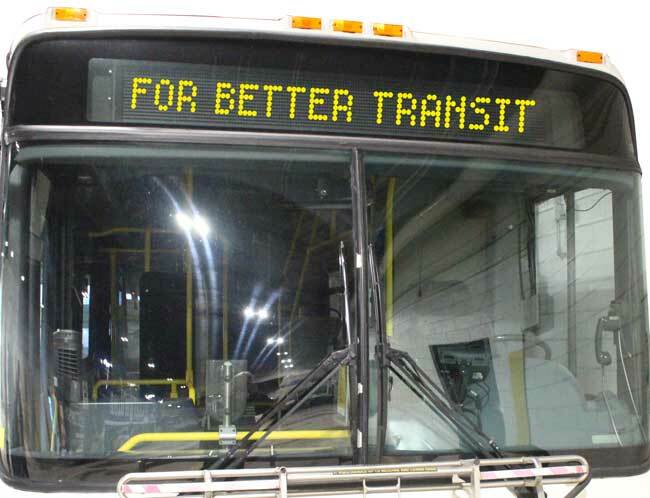 The economic benefits of transit have been documented in a number of Canadian studies. 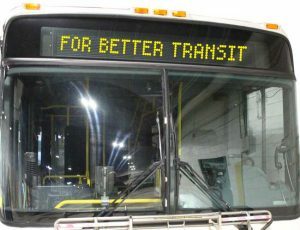 A national study of the economic benefits of transit1 concluded that municipalities could make no better investment than in transit with “a rate of return of at least 12% if not more.” A recent study in Hamilton2 showed significant economic benefits from transit investments, while in Waterloo Region, their transportation plan3 determined that a transit-oriented scenario would provide more economic, social, and environmental benefits than the car-oriented scenario. So the financial case for better transit has been clearly demonstrated. The question is not whether we afford better transit, but whether we can afford not to invest more in transit. So will “Canada’s Best Mid-Sized City” continue to have a “crappy” transit system or will we build a good transit system to provide accessibility for all our citizens, and make the City truly a liveable, walkable, community. The 4th Annual BFAST Transit Users Forum will be held April 21st at 10am (doors open at 9:30). More details & event poster are now available. BFAST is cautiously optimistic about the outcome of yesterday’s budget committee meeting; this is a very good first step – but much more is needed beginning with the development of a long-term transportation plan where all aspects of transportation – transit, motor vehicles, cycling, walking are looked at together and long-term resources are put in place to build a very good transit system – saving costs on roads, parking, pollution. Transportation should be developed and evaluated against, economic, social, and environmental criteria. Additional $372,424 to add five transit operators. This will improve service by providing “layover” time between routes, to allow buses to meet schedules if there are unexpected delays (for example, traffic congestion). Layover times are currently below industry norms. Additional $20,600 to provide transit Holiday Service on Dec. 25 and Jan. 1, the only days where no transit service is currently offered. Committee heard from our Director of Transit that Burlington is the only municipality in the GTA that doesn’t operate 365 days per year. I went to the Metrolinx “Town Hall” on December 12. The Town Hall was held so that the public could ask questions of Metrolinx management and get answers. BFAST supporter Nicholas Civiero had submitted a question on missing funding for local transit in advance online. His question was basically similar to the comments I had sent to Metrolinx on November 7 following the Hamilton Roundtable on the Draft Metrolinx 2041 Regional Transit Plan. The meeting was held in the Metrolinx boardroom at their offices in the northeast corner of Union Station. It was very well attended – ~150 people there as well as many watching online. Unfortunately. the meeting was only 90 minutes long (6:00-7:30) which meant that most questions that people wanted to ask, either in person or online were not presented. Although a number of supporters had voted for the question submitted by Nick to get it in the top ten, the meeting closed before we even got through the top 10 advance online question. 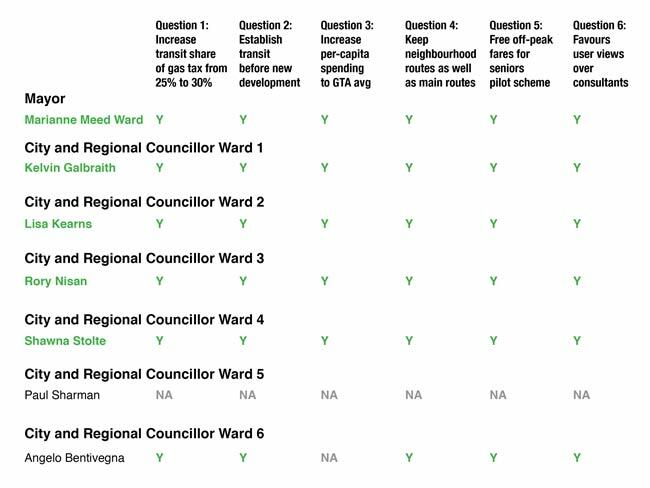 I quickly got in the line for the microphone and was able to ask a question about where the 15% of Big Move funds committed for local transit had gone – roughly $300 million/year for GTHA municipalities. Chief Metrolinx Planner, Leslie Woo gave a very confused and unclear response. I hope to find the recording of the Town Hall to see if I can make any sense from what she said. I also raised the question of parking expenditures and said that Metrolinx’s first/last mile approach seemed simply have people drive to and from the GO stations. Another serious question was raised about the Metrolinx requirement that their capital projects be Public Private, Partnerships. Metrolinx CEO. Phil Verster maintained that 3P’s were necessary to reduce financial risks, but when pressed to explain, simply got angry at the questioner. In addition to the short time allotted for questions, Metrolinx staff were overly zealous in quickly clearing the room after the event, preventing many people from questioning staff. More transit – less parking! In the “Big Move” 25% of funding was to go to the GTHA municipalities. Of this 25%, 15% was to support local transit improvements. This should have resulted in an annual infusion of $300 million annually to GTHA local transit systems. This would have resulted in large improvements to local transit. However, this commitment has quietly disappeared from The Big Move and from the 2041 draft RTP. Instead, we have more parking planned at GO stations! It looks like the first mile/last mile will be by car for most GO users. Even the lower parking scenario, GO will be creating ~ 30,000 additional spaces. At $40,000/space (Clarkson parking facility cost $40 million to create 1000 spaces) this will cost will be over $1.2 Billion! It would be far more cost effective to invest this money in local transit. Also, the large parking lots and parking garages surrounding suburban stations will create large barren parking zones. This will make it more difficult to develop pedestrian-friendly mobility hubs around each station. Also, Metrolinx should be charging for parking at GO Stations. A recent study in Hamilton clearly showed that paid parking will greatly increase the transit modal share1 . Metrolinx needs to review the extensive research on parking strategies carried out by Shoup et al2. This entry was posted in Uncategorized on November 15, 2017 by admin. Due to construction on New Street, Burlington Transit bus # 10 will be re-routed starting March 21st. This re-routing may make it difficult for transit riders to reach the Central Library.